How serious are the SDGs about tackling inequality? The international commitment to reducing inequality marks a welcome breakthrough. But without clearer targets for measuring progress, driving change to tackle rising inequality will be a challenge. Sarah Colenbrander is a researcher in IIED's Human Settlements research group; Andrew Norton is director of IIED. In 2015, all 193 of the United Nations' Member States adopted the Sustainable Development Goals (SDGs). These goals commit every country to take a range of actions that will reduce poverty, promote prosperity and protect the environment. The 10th of these goals (SDG10) is to "Reduce inequality within and among nations". This was a welcome breakthrough. Evidence has accumulated over the last couple of decades that inequality has been increasing (PDF) in the vast majority of countries. Including inequality in the SDGs signalled that governments across the world recognised its costs and consequences. Is this ambitious enough to drive meaningful change? There are two ways to understand economic inequality. Relative inequality is focused on ratios, such as the proportion of total wealth held by different groups. Absolute inequality is focused on differences, such as the income gap between various groups. Imagine a country with only two people. One earns $1 per day and the other one earns $100 per day. The poor person currently receives just under one per cent of total national income. Let us assume that the income of the poor person grows by 50 per cent while the income of the rich person grows by only 1 per cent. The daily income of the poor person will rise to $1.50, while the income of the rich person will rise to $101. The income of the poor person has proportionately grown much faster, increasing their share of total national income to just under 1.5 per cent. Yet the income gap has widened from $99 to $99.50. SDG10 only measures relative inequality – which means that even if countries achieve the quantifiable target, absolute inequality could continue to soar. Yet the political and popular debate about the growing gap between rich and poor makes it clear that absolute inequality is an equally significant concern. However, the income of the poor will have to increase by substantially more than the average prescribed by SDG10 if countries are to reduce absolute inequality of income. In the UK, for example, the income of those in the bottom 40 per cent has to grow at twice the rate of the national average if the income gap is to stay the same. In other words, the income of the poor has to double just to maintain the same difference (in absolute terms) with the average income. This is comparable to India and Indonesia, but much better than China or Mexico, where the income of the poor would have to grow at nearly three times the average. Of the major economies we analysed, South Africa faces the greatest disparity: the income of the bottom 40 per cent has to increase at nearly six times the rate of the average. Another limitation of SDG10 is that it uses average income as a reference point. The global conversation around inequality has not been focused on the difference between the bottom 40 per cent and the average, but on the consequences of extreme wealth and poverty. The phenomenal growth in global wealth inequality has been driven by growth in elite incomes. This point was illustrated powerfully by Oxfam, which famously told the assembled plutocrats gathered at the 2016 World Economic Forum in Davos that the 62 richest people in the world own as much as the poorest half of the global population. Even if we ignore wealth and focus on income, the inadequacy of SDG10’s primary target is obvious when we consider the growth rate that is needed to reduce absolute inequality between rich and poor. In the UK, the income of the average person in the bottom 40 per cent would have to grow at 4.1 times the rate of the average person in the top 20 per cent – just to make sure that the difference between the two remains the same. It would have to grow at five times the rate of the average person in the top 10 per cent. These figures are comparable to the other large European economies: in Germany, the income of the average person in the bottom 40 per cent would have to increase at 4.4 times the rate of their counterpart the top 10 per cent, and in France, it would have to be 5.3 times the rate. To reiterate, achieving this level of growth for low-income households would not reduce absolute inequality. It would merely prevent the income gap between rich and poor from widening even further. The UK performs better than most of the world's largest economies. In the United States, the income of the average person in the bottom 40 per cent would have to grow at 7.8 times the rate of the average person in the top 10 per cent to maintain the income gap. India (6.0x) and China (8.4x) require similar multiples. 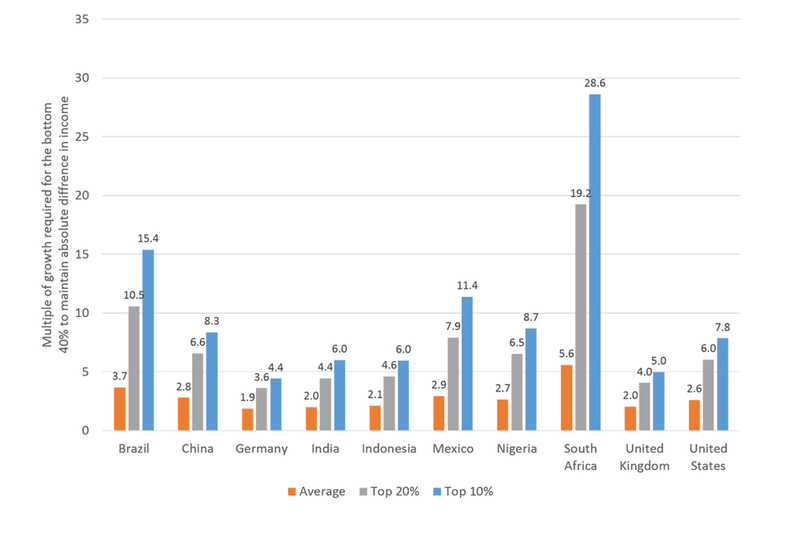 The gap between the top 10 per cent and the bottom 40 per cent is most pronounced in Brazil (15.4x), Mexico (11.4x) and South Africa (28.6x) (see the chart above). These calculations make it clear that governments cannot depend on economic growth alone to solve absolute inequality. Even if the incomes of the bottom 40 per cent do grow faster, the relative rate of income growth required to reduce the gap between rich and poor is so disproportionate as to be unthinkable. Decision-makers therefore need to look beyond growth-oriented strategies to reduce absolute inequality. Steady and determined action is needed to tackle the concentration of wealth within countries. Proposed solutions vary. Thomas Piketty favours a global wealth tax. Branko Milanovic favours measures to equalise endowments and assets, particularly in terms of education. Joseph Stiglitz calls for tighter regulation of the financial and labour markets. There is a widely recognised need to rebuild global tax rules so that all companies and individuals, no matter how well-connected they are, pay an appropriate level of tax. Some countries are even considering a universal basic income. Although a range of policy options are available, meaningful change will be hard to achieve in practice. Indeed, the shortfalls of SDG10 outlined above reflect the difficulty of challenging the status quo. SDG10 broke new ground in getting an international commitment to reducing inequality. But there is still a way to go to translate that intent into targets which address the scale of the challenge of growing inequality at the country level. Sarah Colenbrander (sarah.colenbrander@iied.org) is a researcher in IIED's Human Settlements research group; Andrew Norton (andrew.norton@iied.org) is director of IIED. The data used to conduct this analysis was drawn from the World Bank's Poverty and Equality Database.